Last night my husband and I had an afternoon alone for a couple hours. We could have gone out to eat together, because when you have a family of 6, it doesn't feel like too big of a deal to only pay for TWO people at a restaurant. But... I am TRYING to get a budget system going in our home again and so I was good and pulled out a package of shrimp that I had bought at Walmart for around $6.50. 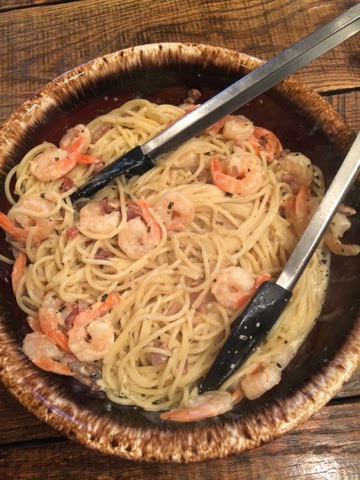 We were recently talking about favorite foods and he said, "I don't know if I have ever told you that I REALLY like shrimp!" Ok.... I kinda knew it, but to be that exuberant about it, I thought, hmmm... Mental note! So, I pulled out the shrimp and a sauté pan. AND... if you like, some chopped bacon is a terrifically yummy addition! Add fat to sauté pan. Once melted, add chopped garlic. Cook till softened, fragrant, and infused. Only a couple minutes. Add shrimp. Cook them just till opaque and then remove them from the pan. Let the wine cook in the garlic butter and let it bubble for a couple of minutes. Pour in cream, cheese, herbs, and seasonings. It only takes another few minutes to bring this all together and it will thicken slightly. 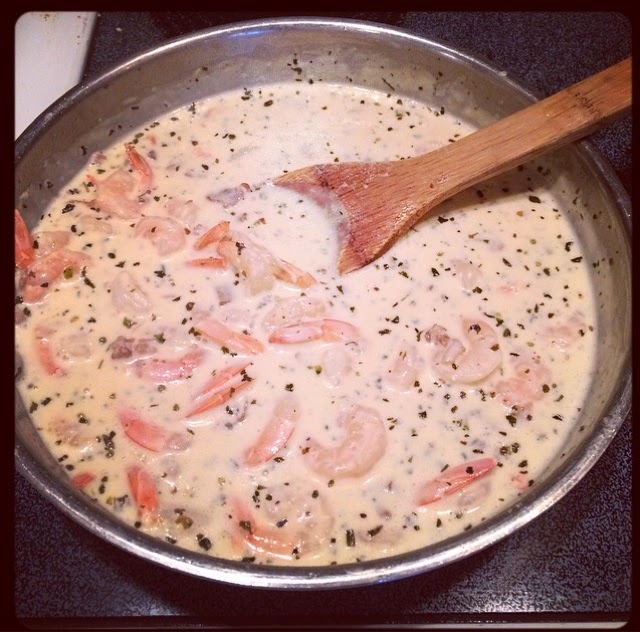 Pour shrimp back into sauce. While this is happening, and obviously, it only takes just a few short minutes, have your pasta/veggies prepared. I only had the shrimp and sauce this time, but next time I make it, I plan on pouring the sauce over steamed broccoli. Mmmm. Add a side salad and bread if you like. My husband is a big eater and we had plenty for supper and for him to have a large helping to take to lunch today! A few GOOD ingredients and we ate VERY well for less that one meal at a restaurant. Looks wonderful! I love shrimp. This. Recipe is going in my THM recipe list. Looks so yummie.